Ledum veteran become champion of the 3rd Late Tasing Darang Veteran Football Trophy today defeating Sika Bamin team 6-4 in the final match, played at the IGJ Hr. Sec. School ground. The winning team Ledum was awarded a cash prize of one lakh while the runners-up got fifty thousand besides individual prizes to man of the tournament, play of the day and best goalkeeper etc. The tournament was organized by Rengging Village under the aegis of District Football Association, East Siang District. 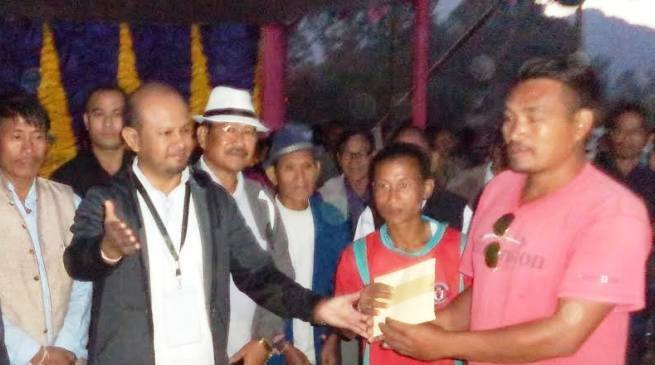 Addressing the soccer lovers, local MLA Kaling Moyong appreciated the participating teams for maintaining discipline and sportsman spirit, they have shown during the tourney. He also conveyed his gratitude to the family members of Lt. Tasing Darang for sponsoring the tournament, encouraging the veterans to take part in sports adding that it was an opportunity to pay tribute to Late Tasing Darang and also to enthral the soccer lovers. Taking privilege, Moyong informed that construction of stadium has been expatiated and would be completed timely and further informed that the present government has assured to open civil terminal for commercial flights soon. He said our forefathers were visionary persons and as a result Pasighat was established century ago with proper planning. Denizens should not encroach free lands but try to protect for future development. Retired DC Tayon Darang appreciated Match Commissioner, General Jamoh for peaceful conduct of the tournament. Azar Siram and Dorung Siram of Ledum team scored two goals in 12 min and 24 min in the first half which was equalized by Tageng Nyitan in 51 min and Tanyong Tamut in 59 min of Sika Bamin team in the second half and went into ten minutes extra time. In the penalty shootout Ledum got chance to win. Dorung Siram, Nalik Saroh, Mali Padung and Apai Saroh of Ledum team scored four goals while Tageng Nyitan and Talo Jamoh netted two goals. The final match ended with 6-4. Many senior citizens and veteran footballers Tamat Gamoh, Nada Apa (DSO Sports) and local leaders were also present.